Find interesting ideas for DIY projects and learn hobby electronics and coding. A blog for all DIY enthusiasts! This article covers the basic concept of how you can implement basic AI in you game, i.e allow the computer to compete with you, giving it equal chances of winning. It's worth a thought what makes the computer invincible in a human vs computer chess game? A common notion is that programmers code for every single possibility in the game considering all permutations and combinations etc. However this is far from reality. We can instead make the computer go by the 'Human thought process ' for every move. Lets consider a simpler approach to the popular TIC-TAC-TOE game. Coming to the TIC-TAC-TOE GAME. This project is a great exercise for beginners to get a hang of basic logic used in games and other applications. The logic behind the computer's moves is simpler than you think. To begin with, lets see the logical flow of code before getting into the 'code'. 1) For the very first move -the computer plays a random corner (after ensuring not to overwrite a corner marked by the user). a) Check if the computer can win in a single move. If yes, mark that box. b) Check if the human can win in a single move. If yes, mark the winning move. 3) Else, play a random move, with preference given to corners. 4) Apart from these steps you may write codes for more specific cases that you wish the computer to understand, such as simple winning strategies like blocking a corner when the user marks the centre. Once you're done writing the basic code as mentioned above you can go about writing codes for tackling situations wherever the computer lost against you, moving one step closer to a completely 'invincible' version of tic tac toe ! Moving on to the programming syntax and logic. This project is made on NetBeans Java 8.1 and requires the understanding of basic programming concepts. It's always better to write codes for such projects yourself than copying things off the internet as such programs appear to be 'complex' to the reader but are very easily understood by the one who wrote it. However you may use the following hints if you're clueless about any particular idea mentioned above. So, those boxes in the frame are simply 'jLabels' in NetBeans (yep, 9 of em). First things first, whats a1? Each variable holds data corresponding to one label letting us know whether its marked 'X', 'O' or is simply empty! When a box is marked X by the user, we set the value of the corresponding variable to 1, or set it to 2 if the computer marks that label. Suppose the user clicks label1 (named as l1 in the code above), the value of a1 is set to 1. After each time the user plays a move, the computerplay() function is called, where the computer plays its move. Here where the logic comes in picture. //the corner played variable tells if any two diagonally opposite corners are marked by the user. //After every game lolwa increases by one. That might seem to be an overdose if you're not java friendly yet, but yeah, this code is definitely not optimised and is really hap hazard. The main purpose of sharing it- is to help you understand the core idea and not how to go about it. The unmark function is similar to the mark function but does the exact opposite. I plan to reorganise this code and make it simpler sometime, once I'm done with my high school leaving examinations. 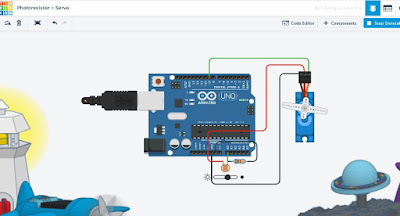 5 Effective Online Tools that will Spice up your Arduino Projects! TV Remote Controlled Servo Motor-Using Arduino!